The market has continued to slow to a normal winter pace with very seasonal activity in most price ranges. Active inventory is up 3.9% from this time last year but still historically very low. Homes have begun to start hitting the market the past few days which will give sellers more competition, buyers more homes to choose from and start the annual inventory increase. It continues to be a different market with Days on Market closer to 60-180 days when you are $500K to over $1Million range. Homes in the Under $500k range are also seeing days on markets longer than 30-45 days in some areas now, which was unheard of just 6 months ago. Average days on market for December was 42 days for Single Family Homes. 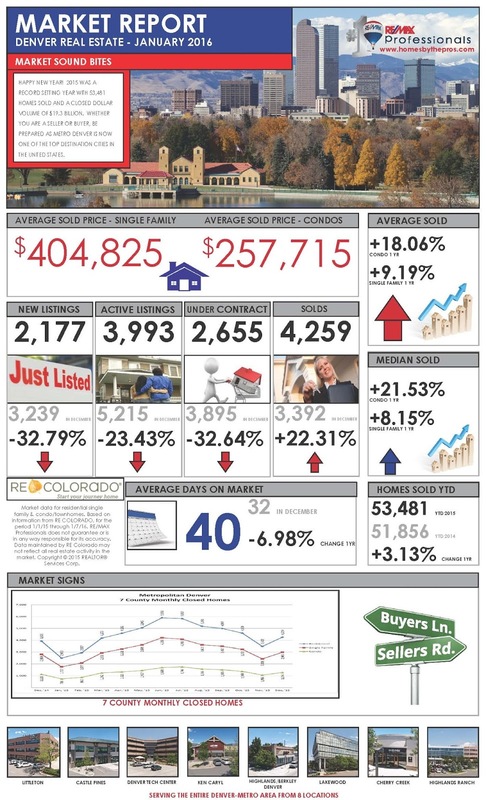 The Market ended December with another decrease in inventory, decreasing 23.43% from November 2015. The inventory of homes available for sale usually increases starting in January and peaks around July. - The December 2015 month end inventory of unsold home Single Family Homes & Condos is at 3,993 homes down 23.43% from November 2015 but up 3.90% from December 2014. With inventory continuing to decrease and interest rates still hovering around 4%-4.5%, we should see a normal stream of seasonal buyers throughout the beginning of 2016 with less homes to choose from. Multiple offers are still happening in the lower price ranges in good areas, full price is still possible for homes with good upgrades, locations or homes priced well, especially in the mid to lower price ranges. Some homes in the middle ranges are beginning to sit for 30+ days now if not priced well, a change from last year. Feel free to forward our market update to everyone you know and spread the word. Please let me know if you have any questions or would like any more specific information. 2015 was a record setting year with 53,481 homes sold and a closed dollar volume of $19.3 Billion. Happy New Year and whether you are a Seller or a Buyer, be prepared as Metro Denver is now one of the top destination cities in the United States. In closing the year and looking forward into 2016, the top concerns are tight inventory, home affordability, appraisal issues, tight credit, and TRID. Happy New Year - 2016 is here and as a Seller, what can you expect from the Denver home market? Overall the Denver home market will continue to move forward; but at a slower pace than 2015. Buyer demand will continue to be strong as Denver is now a destination city. Price appreciation is not expected to be as great as in 2015. New household formations will continue to increase and multi generations will look to buy. Denver will see more Buyers from all over the world. Denver will continue to be in the top 10 home markets in 2016. Consumers will continue to focus on home ownership. New home builders will focus on increasing the availability of their new homes and try to reduce the time needed to build a new home. Buyers today are savvier and more educated when it comes to home markets. Sellers need to be prepared. Home closing time frames are now increasing by at least a week. As a Seller, do not forget the home selling basics, make your plan and stick to it initially and then adjust as the market adjusts. Seller preparation includes a good pricing comparison analysis, instructions on staging if needed, what are the top improvements, and a conversation on how the market functions. As such, the homeowner looking to sell a home needs a professional who is a local expert, market knowledgeable, and can assist in the Professional plan to sell one’s home. Happy New Year - 2016 is here and as a Buyer, what can you expect from the Denver home market? 2016 will bring increased home mortgage interest rates, continuous changes to the closing process, home price appreciation at a reduced rate, strong Buyer demand as Denver is now a destination city, an increase in household formations, more and more Buyer competition will come from all over the world, and market conditions that may challenge all. The definition of what makes a home is dramatically evolving from tiny home to multi generational. Create your home buying plan and stick to it.